Ever since I first laid eyes on the world’s most incredible infinity pool years ago it was instantly placed on my ever-expanding bucket list. Even though most of that travel bucket list focuses on nature and wildlife this pool is one big city attraction I’ve always been drawn to. 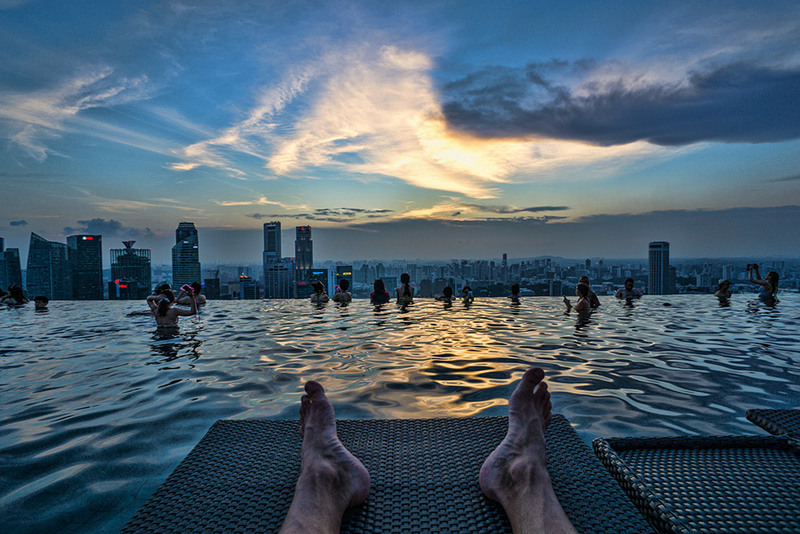 I fantasized about gazing out over the edge and into Singapore’s skyline. I had an aunt and uncle who lived in Singapore 7 years while working for Microsoft when I was a child, and the stories that came from them are where my earliest exposure to Asia came from; which made visiting all that much more alluring. Now traveling through Asia it was time to finally check this one off the list. There’s a catch though – the pool is closed to the public and the only way you to actually take a plunge it’s very inviting waters is to be a guest of the Marina Bay Sands hotel. With the least expensive rooms starting at $278 per night it’s no small expense; but one you’ll have to pay if you want to play. Considering this was my #1 most wanted thing to do in Singapore I made the paid to a guest for 1 night. 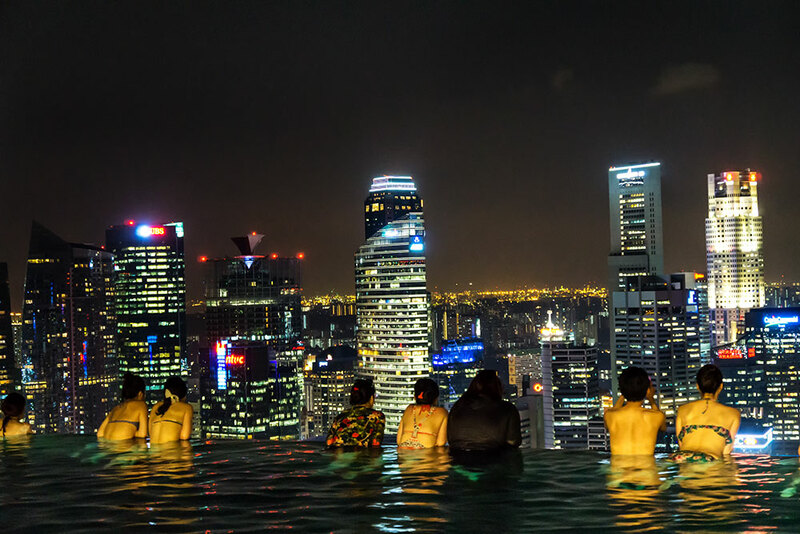 With a $5.7 billion price tag this world-famous infinity pool is part of one of the most expensive hotels ever built. Towering 57 stories over the city, with a length totaling more than 3 Olympic sized swimming pools it is the largest in the world at that height. 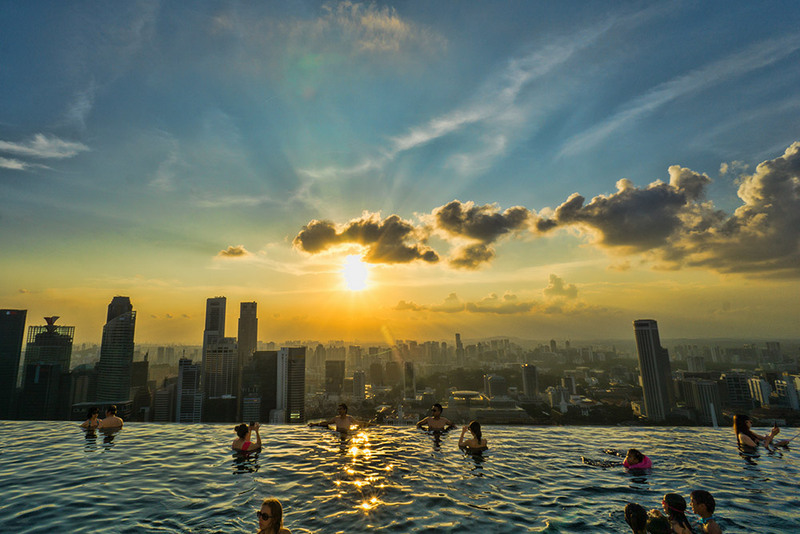 The Marina Bay Sands is a huge hotel with more than 2,500 rooms, a casino, multiple restaurants & bars, a large shopping mall complex and of course the incredible infinity pool. 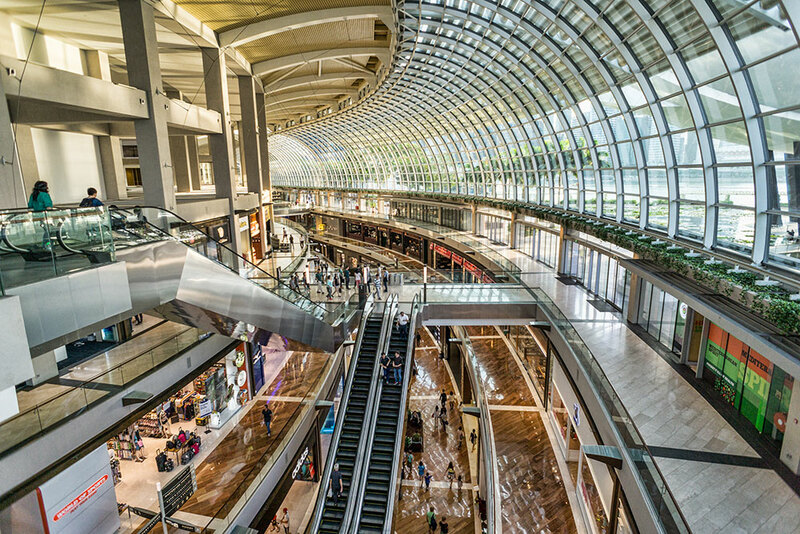 With a large shopping mall attached right to the resort you don’t have to go far to enjoy shopping at the world’s most high end luxury brands and designer stores. With an assortment of restaurants and a large food court there’s also plenty of options to keep your belly full. I’ll be the first to admit I get a little tense and wobbly in the knees when it comes to heights and I had a lot of reservations about how I would feel swimming way up there. Once I actually arrived it wasn’t really scary at all. In photos it gives the illusion that you swim right up to the edge without anything stopping you from falling right over. But that isn’t the case – there’s a hidden barrier that catches all the water spill-off is quite wide. You’re always feet away from the actual edge. 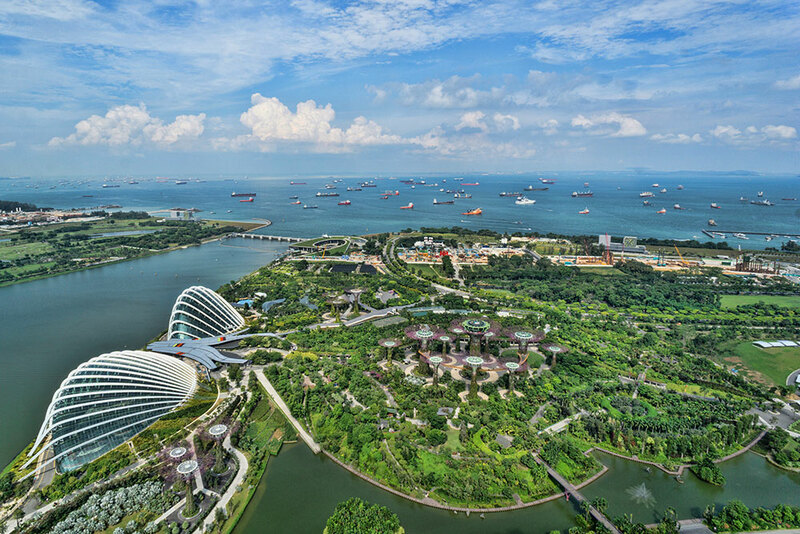 The Marina Bay Sands is located within walking distance of many city attractions like Gardens by the Bay, Cloud Forest, Waterfront Promenade, the Merlion, Helix Bridge and several food courts/shopping malls. The hotel is also connected directly to the MRT (subway) which makes getting around the city a breeze. I left Johor Baru in Malaysia and after crossing the border into Singapore I was able to ride the MRT directly to the hotel – it doesn’t get any more convenient than that! The room was nicely furnished with a comfortable bed and desk, a flat screen TV, and great view of the Gardens by the Bay from the balcony. However, for the large price tag I expected it would’ve been a little larger and more spacious. Considering I spent all of my time up at the pool and walking around the city the room was plenty nice enough for catching some sleep. The marble bathroom was large and clean. It was also well stocked with everything needed get refreshed and clean after a day in Singapore’s humid outdoor temperatures. It’s Even Better At Night! If you thought the daytime view was outstanding wait til you experience it at dusk and after dark! I returned to the pool after a few hours of afternoon city exploration was blown away. After dark all the skyscrapers turn on their lights providing stunning views from the comfortable loungers and from the edge of the pool. With opening hours from 6 am – 11 pm daily you’ll have plenty of time to take in both the day and night views. But if you want to catch it at it’s least busy time you’ll want to get up early and arrive for the sunrise right as the pool opens. 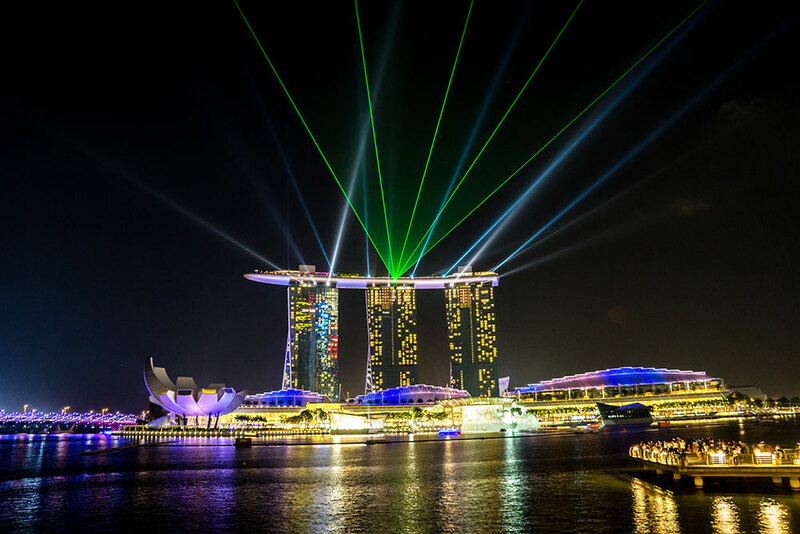 Every night the Marina Bay Sands is part of a visual effects night show on the waterfront. The best place to see it however is a short walk away at the Merlion square. It’s a scenic, fun walk from the hotel and the show is amazing.. don’t miss it even if you’re not staying at the hotel! 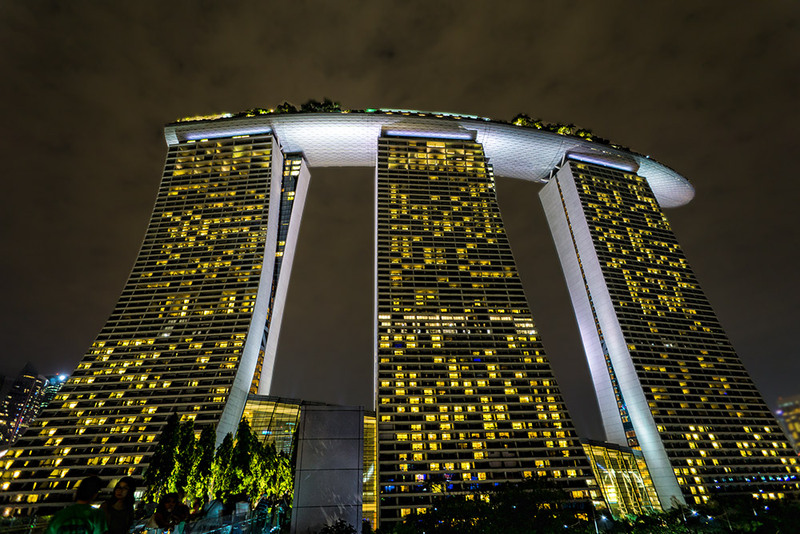 Use Agoda to get the best rate and book your stay at the Marina Bay Sands. I don’t think I’ve ever planned a hotel stay around a pool, but this pool and its view is spectacular. I would totally do it for one night just to be able to enjoy the sunset and the night views! The Marina Bay is stunning!! Been to Singapore on and off this couple of months and we love it! Caught the SG50 grand fireworks and it was amazing. That certainly is an amazing pool! We have one 1/5 the size at the Trump Hotel in Panama City except the city is on the opposite side. Thanks for including pictures of your room. I see many posts about the pool from time to time but never the rooms. They look spacious and luxurious as well. I love it . I have been wanting to go back to Singapore for this and Gardens by the bay. It might not have been the cheapest hotel in the world, but man, the views from that pool were priceless! I’ve also had the Marina Bay Sands on my bucket list since seeing it in pictures. It’s definitely got to be the best infinity pool in the world. Look at that view! That night shot is unbelievable. I haven’t been to Singapore but with views like this it needs to move up on my list. Singapore is amazing! It’s the cleanest big city I’ve ever been to! The food is amazing. The subway makes it easy to get around. It’s safe… the only downside is how expensive everything is. Wow! That’s some hotel. I’ve seen pictures of the infinity pool before, but I’m glad you showed the side view. I always thought you swam up to the edge too. Scary! James the photos in this post are really great (as are all the others as I’ve poked around your blog) and certainly have inspired me to add this to my must-do list. Keep up the good work here! Ok, I think I would stay the hotel in the pool! That looks absolutely stunning! !